The first post in a series of 'mop-ups' that I will be writing in an attempt to round up some half finished drafts, it's-really-not-worth-a-full-review, and general places I have visited but not blogged about. 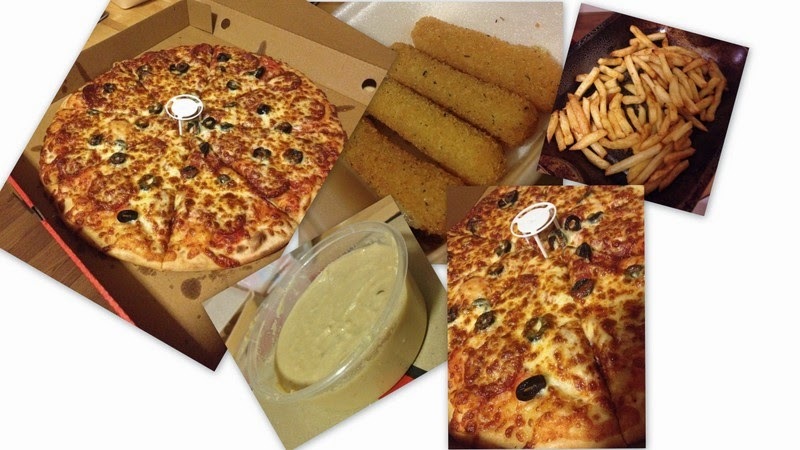 I bring to you in this post Leeds takeaways, mainly in North and West Leeds. I've been back in the LS postcode for just over a year now and in that year I have been astonished with the number of takeaways available to me, this is exacerbated by the fact that all takeaways in Harehills and Headingley (where an unbalanced ratio of Leeds' takeaways lie) deliver to my address. 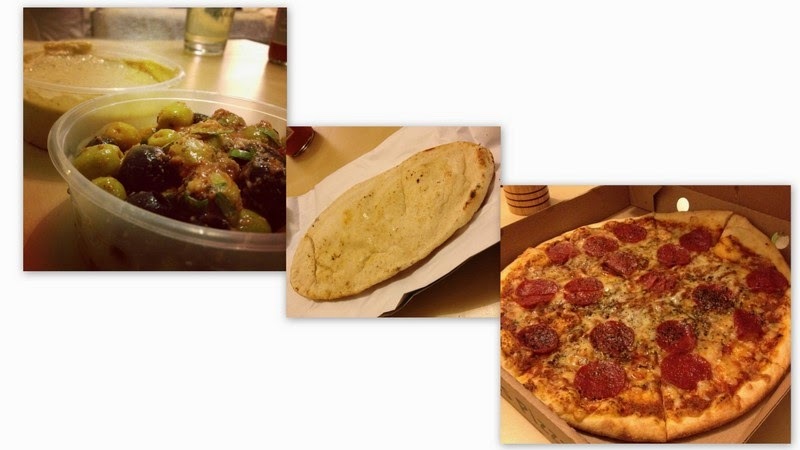 In the search for the best pizza, curry, Chinese and something a little bit different I've tried some rotters and also some pretty decent places too. But mainly rotters, as is the takeaway game. 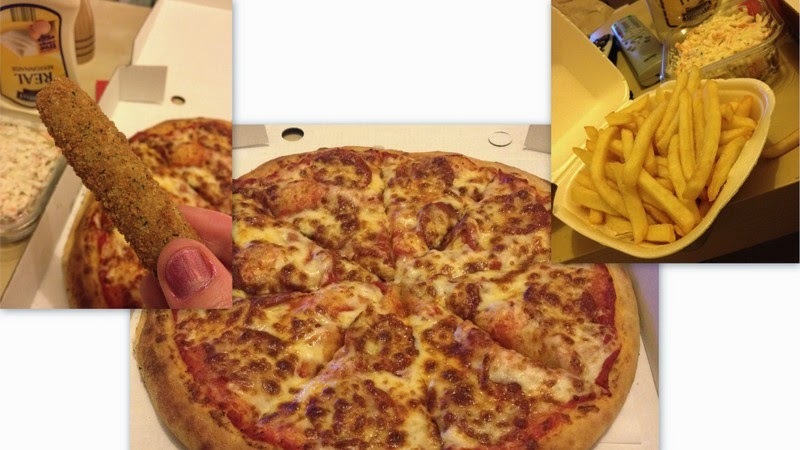 A Just-Eat experiment to find the perfect cheap pizza and chips, added extras are a bonus. I ordered a thin pepperoni pizza with added olives, chips, hummus and mozzarella sticks. They also sell kebabs, burgers, parmos, fried chicken, desserts and milkshakes. The appeal to order from here was the ratings on the website and also the fact that they didn't also try to sell curry alongside pizza like many of the places you can order from on Just-Eat. The pizza was bland, the chips cold, sloppy hummus and the mozzarella sticks had melted and reformed. I haven't ordered from here more than once. One of the first takeaways I ordered on my return to Leeds after getting extremely excited that I could order olives and hummus to be delivered to my door! Moorish was also recommended to by the lovely people of twitter. I ordered hummus, olives, pitta, chips and a pepperoni pizza. They also sell tagines, couscous, mezzes and curries. The olives and hummus were great, the pitta I shouldn't have ordered it was unnecessary, the chips were disappointingly soggy and flat, the pizza was great crispy and full of flavour. I've got Moorish on the hit again list to try out their tagines. Casa Mia established in 1998 used to have two restaurants in Chapel Allerton and also tried a stint in Millenium square. I've had a mixed response from others as to whether they like them or not, but they must have a following to have been around for 17 years now. I had my first taste of Casa Mia in Chapel Allerton when I was half cut and spiralling and loved it. Fast forward a few years and I've been back twice (to Millenium square now closed) and I won't be returning. I've had things added to the bill that I didn't order on both occasions and been treated like a thief when pointing this out... I decided to give them a second chance by ordering from their takeaway service, the tipping being antipasto delivered to my door. I shouldn't have gotten so excited by that anitpasto... although massive in size the fish that was served with it has clearly been in the with the rest of it so long that EVERYTHING tasted of fish. Fishy olives. Fishy ham. Fishy peppers. Fishy artichoke. FISH. The pizza was extremely small and I paid £6 for it to be delivered to me uncut, with all the toppings on one side as it had slid inside the box. The chips were served in a metal container which made them sweat. Nice. Most people in Leeds know the back story of Mr Nice Guys by now, I tried out their takeaway service before they opened 'The Joint' their first restaurant. The waiting times are ridiculously long but this is because they are so ridiculously popular. Top tip - order outside of university term times as it reduces the waiting time by about half an hour. I was hugely excited to order a decent burger from a takeaway, I haven't ordered a burger from a takeaway since I was student, a horrendously drunk student. They also sell CAKE! Takeaway cake!! What an amazing time to be alive when you can have cake delivered to your door. I've ordered from Mr Nice Guys a couple of times now and haven't been disappointed, full to the point I'm almost sick yes, disappointed no. In the top left hand corner you can see their chilli cheese fries - pure over indulgence. The burgers are nice and naughty burgers, the cake is a Daim bar cake! They also sell a range of American treats such as grape Fanta. Not to be confused with the same named place in Garforth (which I blogged about here), although you wouldn't be foolish to think they are one and the same. The dishes are so similar in appearance and quality it surprised me to find that they were independent of each other. It's my local Chinese takeaway, they don't deliver and they are more highly priced than some of the others in the area but the quality is always there. Dominoes' rivals have finally made it up North, I've heard about this place previously from my southern friends and was intrigued to try them. They are ever so slightly cheaper than Dominoes but still more expensive than most of the local pizza takeaways, at the time of writing they don't currently deliver in Leeds and so we have had to collect both times we have visited. 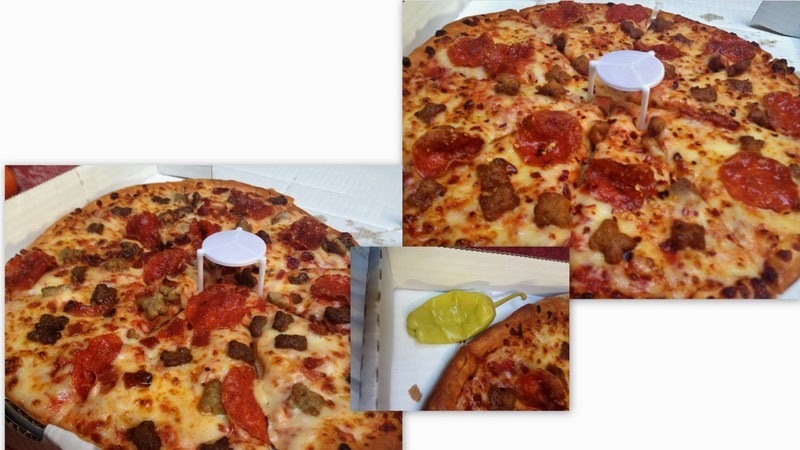 Believe it or not the two pizzas below are different, once is a spicy Italian and the other is sausage and pepperoni. The pizzas also come with a chilli in the corner of the box... I think I prefer the dominoes dip in the corner of the box... actually I think I prefer Dominoes pizzas. A chip shop that delivers? Madness. I haven't ordered for them to deliver so I can't comment on waiting times. Yes I got off my bum and walked to the chippy on these occasions. I've order the fish, it's very expensive, the second time being my last ever as the fish tasted 'off' and put me 'off' for life. I did take a picture somewhere along the way of the fish and chips but now all I can find is this picture of a chip buttie. I remember very little about this takeaway, which is odd for me as pictures usually bring back memories. All I can therefore state about this takeaway is that it wasn't very memorable. From doing this round up/mop up it's become clear to me that I have my set favourites! Those being mozzarella sticks, pizza and chips! Rule of thumb for me is to order my 'regular' and if somewhere can do that well then experiment with other items on the menu. I think you can always judge somewhere by how well they do your favourite. There are a few places missing but I'm sure you'll cope with the not knowing. I have managed to blog about a few takeaways in Leeds over the last year below is a link to the full post if you want to find out more. (I promise they're not all sponsored, well actually most of them are). "Hopes weren't high when the pancakes came in a plastic bag, the duck wasn't quite 'ducky' enough for me but it made an okay wrap with the plum sauce and veg." "A relatively dry curry it was packed full of flavour, and at my request it came medium spiced. Not too hot not too mild, it left a warm after feeling dancing around my tongue and inner cheeks. (£7.95) Not the best Karahi I've had (you'll find that in a takeaway in Saltaire) but it's close"
"Mine was a dryer curry but spicier, consisted of just chicken but had more flavour. That wasn't to say that D's was poor, it wasn't, I just preferred my own." "I struggled to tell which was the salami and which was the pepperoni, an indication of the quality of each. The base was crispy and not laden with grease." "We ordered a few sides to accompany our pizzas, your standard sides or chips, coleslaw and mozzarella dippers. The mozzarella dippers were fab, we couldn't get enough of them and the coleslaw was a massive portion which I mainly left to A to work her way through. The chips? I have no idea they didn't turn up." 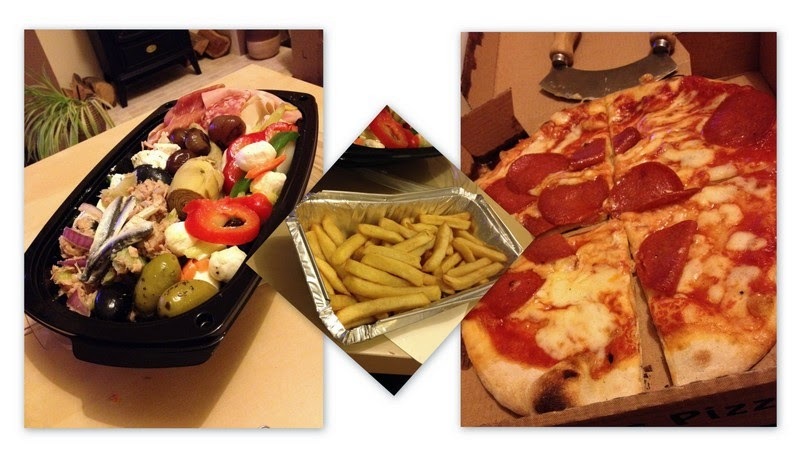 Try Box Pizza in Burley - they deliver to us in LS7 and the pizzas are very good. We're slightly addicted to the Gorgonzola (blue cheese, salami, walnuts and Rosemary).